Thanks for the considerations and great review from the judges. Both judges correctly identified that he would do much better with a bonding option which I completely agree with. A good portion of my playtesting and pricing consisted of future-proofing him to a knight bonding option that may exist in the future. Explicitly not making him relentless now seems more of a mistake, especially with the Knights of Blackgaard who were released after I designed him. I will also put further consideration into his life total. 4 puts bloodstorm into the realm where you don't want to spam it and alternate between the attacks but it puts you right on a knife's edge. I will try to work on this rapidly while availability is still sufficient. Thank you again for your consideration. Viceron the Dark Knight has received two Nay votes to induct (superfrog and Son of Arathorn) and is removed from the process. I would like to submit Viceron the Blood Knight for consideration of the SoV judges. Balance Viceron is a relatively high variance hero that bonds with a B- squad (Death Knights of Valkrill). He is eclipsed in a head-to-head fight by many less expensive heroes, excelling instead at blasting away lower attack and defense squads (although still able to fill other roles in a pinch). 145 points is an appropriate pricing given his typical performance and impact on the game, bearing in mind that he is not an elite unit. He also shares synergy with the Knights of Blackgaard but I found it generally difficult to justify drafting him over just another squad of knights. Creativity Viceron uses life as an interesting resource that provides decisions throughout the game. Choosing to use Bloodstorm Ritual over his normal attack can at times be a 2 life swing, and his life is still low enough that simply spamming his ability is not a reliable option. While his blast is similar to that of Brimstone, the constant attack and life management make them play very differently. Theme Viceron the Blood Knight; hated and feared on his home world. He knows that there is no cost too great in the name of victory and is ready to use his own blood as a reagent to unleash terrible and powerful magic. He compensates for his sacrifices with his enchanted sword, capable of draining the life force out of those he slays and reinvigorating him. He has used this unnatural blood magic to extend his life, becoming a warrior of unrivaled skill and protected by magical armor that has been tempered by the blood of his enemies. Viceron comes from the planet of Toril. Accessibility The figure is the Thrall of Blackrazor from D&D Miniatures - Unhallowed. The accessibility has not meaningfully changed since the figure's last submission. Name changed to Viceron the Blood Knight: I had the Blood Knight title originally but changed it to dark since I felt his abilities put it a little on the nose. I don't feel strongly about it and I'm ultimately okay with repetition to hammer the theme. Blood magic. Personality changed to Relentless: It was always the intent for Viceron to be a bonding hero for a squad that would exist in the future (my hope is to one day see knight bonding). I forced the matter by deliberately excluding him from bonding options which was to his detriment since he was still priced for being a bonding hero. He is one of the more thematic bonding options for the Death Knights, sits in an open area for points, and provides them with a sort of ranged special attack that can hit multiple opponents in addition to being able to crack high-defense enemies. His special couples nicely with the death knights who are otherwise thinly populated and of high enough defense that they have a decent chance of surviving an attack if they are caught in one. Relentless otherwise suits his theme just as easily as merciless and connects him to the Knights of Blackgaard. Life increased from 4 to 5: I always wanted the tension in when to use his special attack and when to make a normal attack but 4 life was pushing it a bit too far. With a fair amount of luck, his 5 defense could help him perform but he could just as easily be blown away and not amount to much. 5 life keeps some of this tension but also makes him a little more reliable and less likely to crumple without accomplishing anything. Points decreased from 150 to 145: Much of my testing for him as a bonding hero to future-proof him for a squad that would do that was done using existing bonding options who are much more powerful than the Death Knights. The odd point total also provides some variety with the odd-point Death Knights and their some of their other bonding options to put together builds over a variety of point totals. As an additional note, this is far from being "thrown together." The unit is similar enough to the original that much of my initial playtesting applies (particularly since much of my testing there was with bonding) and I have been playtesting the changes I have made excessively for the past few days. I thought that Viceron was decent before; hard to get his value, but that's nothing new for swingy units. I'm hoping the extra life, bonding, and reduced cost don't make him too powerful. Viceron is a pretty cool figure. Very good stats. I am always a little bit worried about four attack Area of Effect abilities (the only ones in the original game is Jorhdawn's conditional Rain of Flame and Mimring's easy to prevent Fireline; the only one in VC is the very powerfully swingy Quahon). However, I think the risk is appropriately balanced since he has to get in close to use Bloodstorm Ritual. 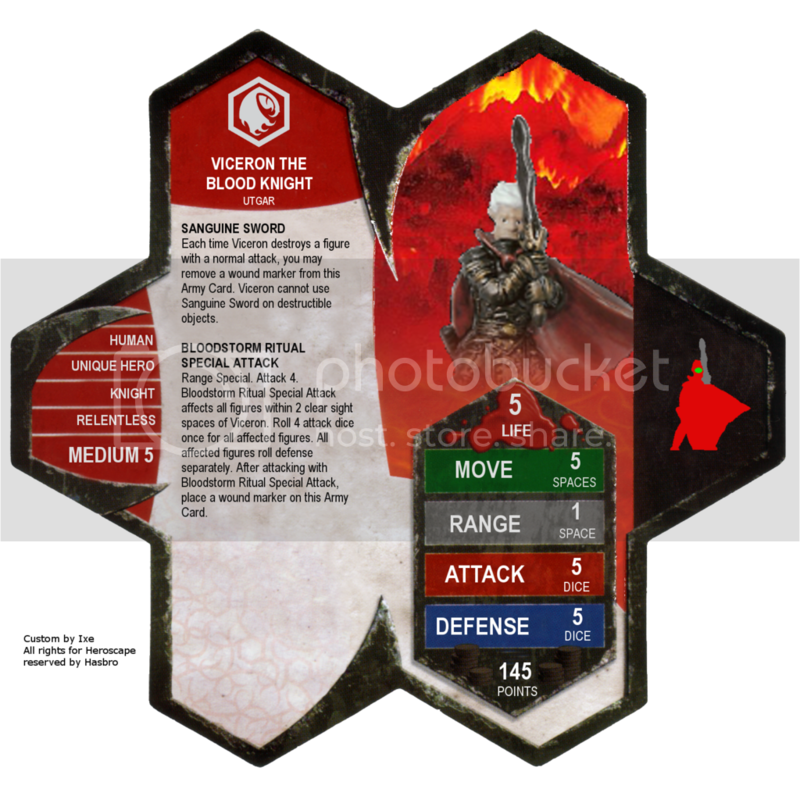 Viceron the Blood Knight has received 5 Yea votes to review (Scytale, vegietarian18, Son of Arathorn, capsocrates, and Soundwarp SG-1) and moves forward in the process. Rampage has passed United Fanscape review and moves forward in the process. Viceron the Blood Knight has passed United Fanscape review and moves forward in the process. Am I the only one who preferred the name Viceron the Bloody? Blood Knight makes it sound like he's part of a non-existant cadre of Blood Knights - Bloody just sounds like a title he was given for his atrocities, much cooler, IMO, and more menacing.